The Wall Street Journal is suggesting that Idaho potatoes might be in for some competition from their sweet orange cousins. According to the U.S. Department of Agriculture, per capita production and consumption of sweet potatoes and yams has steadily increased over the past decade. 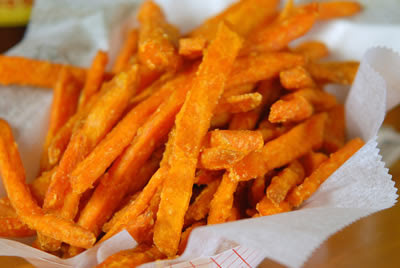 The percentage of restaurants in the U. S. that offer at least one sweet-potato dish has doubled in the last five years and if Boise eateries are representative, nearly all of the really good ones around here can whip up a decent sweet potato fry. But despite churning out trillions of fries for the billions of people served, you won't find sweet potato fries at McDonald's. . . yet. Back in the 1940s when Idaho entrepreneur J.R. Simplot, invented the frozen french fry and changed the potato market forever, I bet he never figured on the changing tastes of consumers. Perhaps we just want something different—something sweeter or something brightly colored. Maybe it's that we want our fried foods to have some redeeming characteristics, like high fiber content and buckets of vitamin A. The difficulty is that sweet potatoes and yams tend to be irregular in almost every aspect. When I pick through the pile at Winco, it doesn't matter whether I'm cooking for myself or for the whole neighborhood—I only need one yam. Also, their color isn't uniform, even within the same tuber, and their shape resembles everything from a croissant to a weasel. These features mean it takes extra labor to prepare them for processing, and even then traditional potato-cutting machines can't always make good fries out of true oddballs. Enter ConAgra Foods, Inc. WSJ reports that the food industry giant is collaborating with scientists to redesign the sweet potato through selective breeding. ConAgra is also in the process of building a multi-million dollar sweet potato processing plant, thought to be the first of its kind in this country. It might be five or six years before the russet begins to surrender its market share, but I'll be the first one to take a bite out of traditional French fry profits.